A workflow composition functionality, where various alignment generators can be positioned. Their resulting mapping sets can be used as input for filtering methods, other alignment generators or combined into overlap sets. The Amalgame toolkit realises the second step of a workflow specified by the Europeana Connect project for SKOSifying vocabularies and converting collection metadata into the EDM (Europeana Data Model). The first step, conversion of XML data into RDF, is supported by the XMLRDF tool. We're happy to announce our paper about Amalgame was accepted as a full paper for the International Conference on Theory and Practice of Digital Libraries 2011 (TPDL 2011). The extensive online appendix also contains a rich use case description. Michiel Hildebrand has made a screencast explaining the workflow building functionality of Amalgame. Amalgame builder from Michiel Hildebrand on Vimeo. GTAA to Cornetto. Here, Amalgame was used to interactively construct a workflow composed of simple matching and filtering elements to align the GTAA vocabulary of the Dutch Sound and Vision Institute with the Dutch lexical thesaurus Cornetto. Using different matching, filtering and disambiguation strategies, we can achieve a higher mapping coverage. WordNet 3.0 to WordNet 2.0. In this use case, different versions of Wordnet are aligned using a combination of simple lexical matching techniques. GEMET-Agrovoc. In this usecase, the evidence for a concept correspondence from label matching techniques in multiple languages was combined to improve the precision of the mapping. Amsterdam Museum - Various pivot vocabularies. Here, we interactively identify different parts of the source vocabulary and map these to different target vocabularies. Geographical concepts are for example mapped to a geographical thesaurus. We describe this alignment in more detail on the Amsterdam Museum as Linked Open Data page. Austrian Mediathek - SWD/Geonames. In this use case, we also use the tool to split the source thesaurus into a geographical and non-geographical part. Simple lexical matchers are then used to map each part to its appropriate target vocabulary. PICO-AAT. This use case is a relatively simple one where a good mapping is easily produced. We here use the tool to identify and isolate ambiguous and non-ambiguous matches. One of the key components of Amalgame is the evaluation interface. A user should be able to use it to quickly and effectively analyze and evaluate produced (intermediary) alignments. 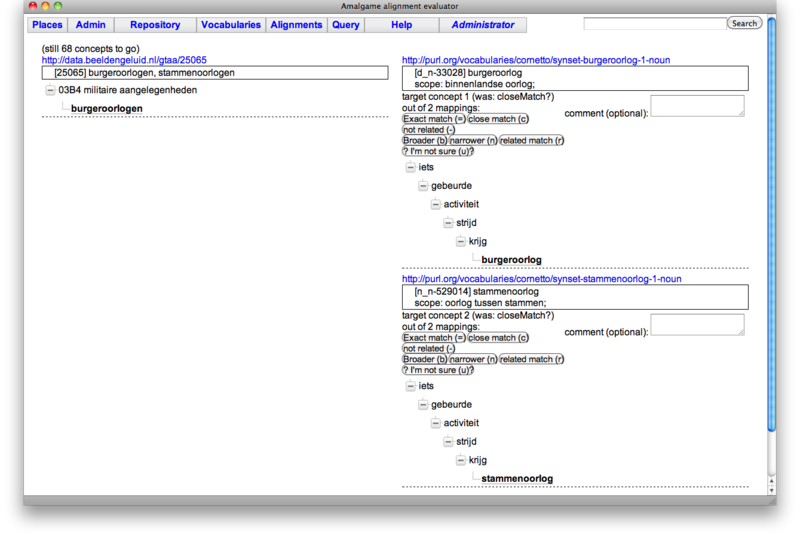 The above image (click to enlarge) shows a screenshot of the current Amalgame evaluation prototype. On the left the source concept from GTAA and on the right two target concepts from Cornetto. The GTAA concept "burgeroorlog" (Dutch for civil war) with alternative label "stammenoorlog" (Dutch from tribal war) is mappedto two different targets. The target concepts in Cornetto, civil war and tribal war, are siblings as they are two specific types of war. Amalgame is an interactive Alignment server under development at the VU University Amsterdam in the context of the PrestoPrime and EuropeanaConnect projects. Amalgame is built on top of the Cliopatria environment using SWI-Prolog. The Amalgame team consists of Jacco van Ossenbruggen, Michiel Hildebrand, Antoine Isaac and Victor de Boer. CSS design adapted from on NodeThirtyThree. Banner image "As-cast wrought-grade aluminium alloy" by CORE-Materials.